Google is known for producing innovating apps that provide maximum convenience to the user. Such apps are integrated with powerful AI that makes so many of our day-to-day tasks easier and convenient. The leading name among these apps is the powerful Google Assistant that has been listening to and fulfilling our commands without us having to touch our smartphones. While these features may be brilliant, there is a huge cost of using them. Apparently, it may seem like these apps and services are free, but behind our backs, Google has been using the data that it collects via these apps for its own benefits. What Google can do with your Voice History? In the modern digital age, this statement applies on every person using a service free of charge. No matter whichever service you may be using, if there is no cost attached to it, this means that the company may be using some other model to make money out of you. And Google certainly has other avenues to make money out of your private data. Google is a “search advertising” company. You must have noticed Google ads in the free versions of apps that you’re using on your Android device. Ads also come up whenever you search for anything on Google. To make more money via these ads, Google depends on any data that you provide and uses it to create personalized ads that entice you into buying the advertised product. If you go through Google’s terms and conditions, which apply on all of its free services, it clearly states that the tech giant will have the right to “host, store, reproduce, modify, create derivative works, communicate, publish, publicly perform, publicly display and distribute” any data that is stored in its apps. This includes the data that you add in your Google Voice History app. 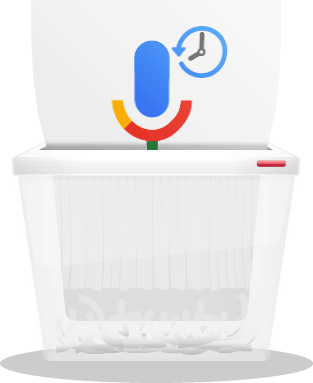 Why would you want to delete Google Voice History? Google Voice Search, or just Google Voice as it is most commonly referred to, is an amazing app that listens to your commands and fulfills them without you having to even touch your device. It works via Google Assistant and other apps. You’ll also find Google Voice features in the Google Translate app, letting you translate languages spoken verbally on the go. However, like all of your data, Google stores and uses your Voice history too for advertising purposes. Imagine every command made by you being processed by giant machines trying to learn and imitate human behavior. Your daily habits are analyzed via these voice messages and added to your own profile created and managed by Google. The worse thing about Google Voice History is that it may be recording our voices without us even knowing about it. The command “Ok Google” usually opens the Google Assistant app. Many a times, Google may misunderstand anything you’ve said as the “Ok Google” command, and it will then listen to your conversation for the next 10 seconds at least. These conversations can include anything, and you certainly wouldn’t want a stranger listening to it and adding the gathered data into your profile. If you want your personal life to remain personal, then it would be better if you delete Google Voice History altogether from your device! Step 1: Find the Google Activity panel for your voice search entries by clicking this link while you’re logged into your Google account. Step 2: Click on the three dots at the right end of the search bar to open a drop-down menu. Step 3: Click Delete Recordings and confirm your choice. Step 1: Go back to Google Activity Panel and click on three dots at the right end of search bar. Step 2: Click on “Activity Controls"
Step 3: Hit the switch next to “Voice & Audio activity” to stop Google from collecting your recordings.